There were 197,575 occupied dwellings in Tasmania according to the 2016 Census. Of that, 54,034 or 27% were rented. Of that, 7,259 were public housing, 6,151 were community housing and around 39,000 were private rentals (RoGS, 2017 and ABS Census 2016). 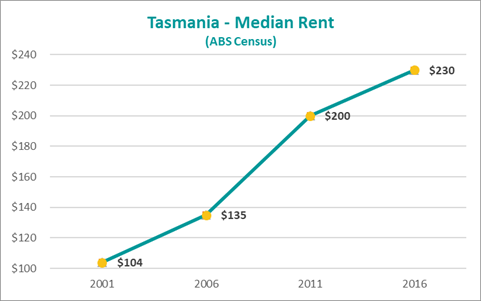 Tasmanian median rents have more than doubled, going up by 121% between 2001 and 2016, compared to inflation which rose by 46% in that time.